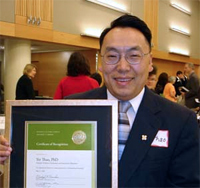 Yer Thao, PhD, is the first Mong to earn a doctorate in the United States. 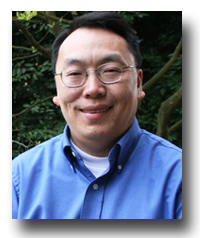 Since fall 2002, he has been part of Portland State University's Department of Curriculum and Instruction of the Graduate School of Education. He teaches multicultural, cross-cultural, bilingual education and current issues in education and society. His research interests include ethnic identity,bilingual and multicultural teacher training, linguistic diversity and oral tradition. He is the youngest child in a large family of 11 from Laos. Thao, who has written The Mong Oral Tradition: Cultural Memory in the Absence of Written Language, was recently honored with the President's Diversity Award at PSU. He is the only faculty member to receive the award in 2008. In his own words, Thao discusses his research work focusing on how Mong communities in the United States are struggling to preserve their oral traditions. I’m from the Mong culture, among cultures in the United States that practice the oral tradition in ceremonies and everyday life. Many continue to struggle with print culture. I wanted to capture the wisdom and knowledge of our elders while many of them are still living. Mong children in the United States go to school to learn how to read and write. But at home, there is still an emphasis on the oral culture. It’s important to understand how different generations are coping with the shift from oral to print culture. Because I originally came from an oral culture, oral tradition has been a passion of mine when I was in graduate school. It’s always been part of my research interests, mainly because America is increasingly becoming a multicultural society. I wanted to understand how oral traditions can play into multicultural education. It’s also my goal to help society understand the broader perspective of multicultural education by looking at oral culture and how it compares with modern print culture. As part of the print culture, we have much to learn from people from oral traditions. My research focuses on understanding polarity of lifestyles between oral and print cultures, and how people from oral cultures can build bridges to people from print traditions. The oral tradition has a way of capturing knowledge that is different from a “print” culture like American society, where we gain knowledge primarily from going to school. In oral cultures, knowledge is gained through other means: by having a mentor or being an apprentice. I also look at how people from an oral tradition use language: in articulation, language maintenance, and language practice. This is helpful in understanding how people can maintain language and cultural identity. Mong communities have been in the United States for the last 30 years. The first “wave” of refugees came from 1976 to 1986; the second wave came during 1986-1994. The third wave started coming in 1997 through the present day. The people that came later had been living on the border of Laos and Thailand. Those that came in the 70s and 80s had U.S. born children, and many of the children are in their mid-20s now. Mong communities are all over the U.S. Some of the larger Mong communities are in Minnesota, North Carolina, California and Kansas. My research focused on 13 elders who live throughout California. Oral culture is maintained in Mong communities because it’s a way of supporting each other and to keep the Mong culture and its practices alive. In working with the elders, I learned that they have tremendous knowledge and wisdom that have been passed down through many generations. People from oral cultures are very knowledgeable and intelligent. Their approach toward knowledge is different from people from print cultures. They don’t have ego interference, and there tends to be a lack of knowledge “ownership.” In oral cultures, knowledge is passed down and shared by the community, and not claimed by individuals as his or her own. People freely express their knowledge, stories and lifestyles. Mong people are very respectful to each other. People depend on each other more. In print cultures, there is a tendency for people to be isolated, and therefore become independent. We can choose not to be around as many people. We can go off on our own and learn what we need to learn from textbooks. I learned from the Mong elders that relationships between people in the community are highly valued. In my research, I also explored the concept of time in oral culture. People from the oral culture don’t live under the dictates of a schedule. They spend as much time as they can in doing something they really care about. When I was visiting people in their homes, they were so welcoming and spent as much time with me. I learned a lot just spending time with the community. There were so many stories that they shared about growing up in the village and living with their extended family. Many stories are about farming, hunting and gathering. They shared stories about courtships, how they raised children, and how they passed on knowledge to the next generation. The relationships between people in the community are really strong. Somehow, in our print culture, we have lost these connections. But maybe there’s a way to recapture the connections and the relationships, so we can have a more peaceful and harmonious culture. The 13 elders I spoke to sacrificed a lot in their transition from oral to print culture. It’s like they jumped more than a century or two into the future. The lifestyle they left in the oral culture was like living in the 1500s. Before coming to the U.S. in the mid-1970s, they’ve never been to school or never had any experience about how indoor plumbing works. They had to make a 360-degree shift in their way of seeing the world. They expressed that the transition to the States was like being a young child learning everything about the world. In our print culture, credentials are important. We obtain credentials by going to school, or obtaining degrees and certificates. In the oral culture, people may not have these types of credentials, but their knowledge is deep and valuable. Many such people can’t make a good living. People from other countries may not have print credentials, but they’re highly intelligent. It’s important for us, people in the print culture, to recognize the skills and talents inherent among people from oral cultures. Pictures and symbols were very helpful for people coming from oral traditions, in figuring out their new life in a print culture. They came from a culture without a written language. Words on a page do not mean anything to them. Later on, as a political refugee, he had to ride one of the “metal eagles” to come to the U.S. He was living in a refugee camp in Thailand, and had no idea where America was. He thought that people who go to America arrive on the other side of the blue sky. The elders try to preserve the culture through family ceremonies: funerals, weddings, New Year celebrations. They encourage young people to become apprentices so they can learn the ritual sequences, chants and songs for each ceremony. There are young people who do this, but it’s difficult for them to stay focused. They are busy with school and other activities. Passing on cultural traditions is easier for larger Mong communities. There are Mong community centers dedicated for that purpose. The elders talked about the sadness they feel as they see how their grandchildren in this country are beginning to lose the connection to the culture. They have managed to keep the culture for hundreds of years, and now, they are struggling to preserve the oral tradition and keep the culture alive. They expressed deep frustration that the younger generation appears to discredit their experiences, values and knowledge. They are concerned that their grandchildren do not believe the ordeals they went through. They feel sadness about how young people disregard Mong traditions, and do not see the importance of preserving the culture. They also expressed sadness about how the younger generation is becoming increasingly disrespectful – arguing with parents and elders, challenging their authority. They say that the modern culture creates a lot of confusion among young people, especially about the value of family. They are very concerned about losing important family connections. The other concern they have is how values and traditions of their oral culture gets lost as they are translated into print culture. The Mong culture’s “sacred knowledge” – belief in spirits and how to respectfully communicate with them – does not get captured very well. The younger generation is more independent, and no longer as dependent on community elders for advice and support. The elders expressed that individual independence is eroding important family and community relationships that are built on trust and mutual support. Learning the stories of our Mong elders was a truly rewarding experience. It is my hope that my research will work to advocate for oral cultures that are struggling in this country. There is a large threat that the gifts of the cultures will be forgotten. By letting these stories known, the hope is that these cultures can be preserved. "In print cultures, there is a tendency for people to be isolated, and therefore become independent. We can choose not to be around as many people. We can go off on our own and learn what we need to learn from textbooks." "It’s important for us, people in the print culture, to recognize the skills and talents inherent among people from oral cultures."